One of many arresting Azores vistas on São Miguel island. • and other reminders of their volcanic past (and present). Portugal's Azores Autonomous Region is far out in the Atlantic, almost 1,000 miles west of Lisbon and 2,400 miles east of the United States. The nine little islands only add up to the size of Luxembourg and total just 250,000 inhabitants. For millions of years, these islands have been building up in eruptions bursting from the Atlantic floor amid the turmoil of three tectonic plates (North American, Europe, and Africa). And the action isn't over. Another big eruption hit Faial in 1958. 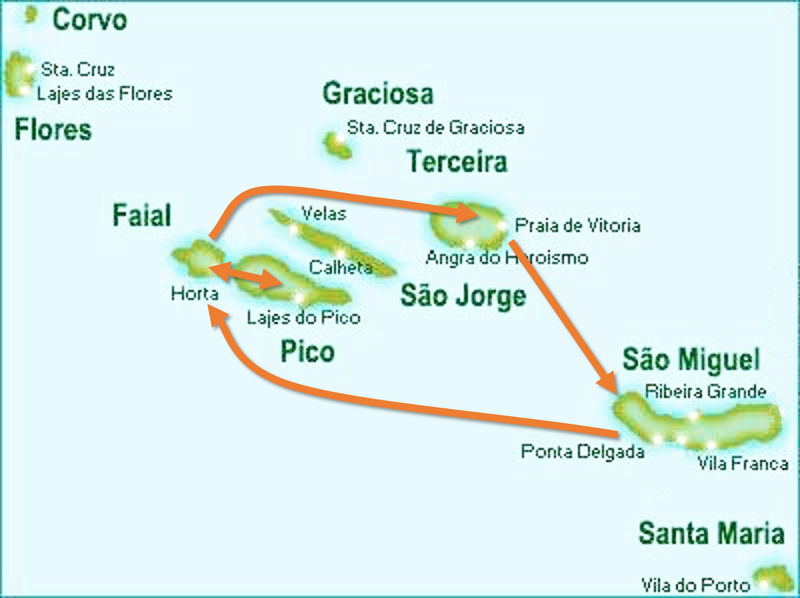 The largest and most populated island is São Miguel which has the capital city Ponta Delgada and the main international airport. The far western end of the island shows the high volcanic cliffs. Crater lakes dot the island. This one in the midst is Lagoa de Santiago. On the eastern side of the island is Lagoa de Furnas. Lagoa do Fogo was the most beautiful of all the crater lakes. Green fields are the home to about 100,000 grazing dairy cattle, mostly Holstein like these. Reports say the 2,000+ dairy farms on the tiny Azores produce half of the cheese, a third of the milk, and a fourth of the butter for all of Portugal. Click to enlarge this panorama photo. All towns we saw were incredibly neat and tidy (reaching Switzerland and Disneyland levels of cleanliness). This is the central plaza at Ribeira Grande (town pop. 10,000). My camera captured this at maximum zoom. Unobtrusive whale "watching" is the righteous thing to do, but it would nice to be a little bit closer. At the Terra Nostra Gardens, geothermal springs feed small, clear hot tubs and this large warm pool. But in the big pool (shown above), the rich mineral water was a terrible color. Discovering I had no other pics of myself on this island, I tried to recolor the water, but gave up and give you these three edited finalists. Flying into Faial, you see more basalt cliffs, neat fields, and some dairy cattle. At Faial's western tip is Ponta dos Capelinhos made by lava from the 1958 eruption. Horta (town pop. 10,000), the main town in Haial. By chance, I got to see this folklore group of two dozen residents keeping alive Faial's traditional music and dance. Ponto do Pico (Mount Pico) is the highest mountain in Portugal (7,713 ft; 2,351m). Here is the dormant volcano viewed from Horta's harbor, a ferry ride away. Portugal's flag flies from our ferry arriving in Madalena (pop. 7,000), the largest town in Pico island. Mount Pico, behind the church, is already wrapped in clouds. Vineyards surpass dairies in Pico. For centuries, grapes have been oddly grown on the rocky ground (not on a trellis) in tiny plots protected by volcanic stone walls. Some remnants of eruptions remain in their raw, undomesticated glory. however, this misguided herd is on the wrong side of the street. Spotless, perfectly painted, pedestrian streets in the old towns of Terceira. Extraordinary Algar do Carvão is the now empty lava chamber of a volcano. This is just one small part of it. The main volcanic chimney of Algar do Carvão. I thoroughly enjoyed the Canaries, Madeira, and Cabo Verde (photos to come), but overall I have to say that the Azores were my favorite. 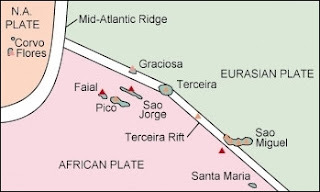 Some geology was more dramatic on the other archipelagos but I liked the cozy, clean, small scale, less touristy, mellow variety of the Azores. 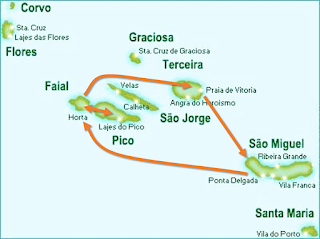 Booking a return trip to the eastern Atlantic, this is my first choice.